The Smarter Planet Lab is an innovative collaboration between the BA/BSc (Hons) Digital Art and Technology course, i-DAT (the Digital Art and Technology research group) and information technology giant IBM. 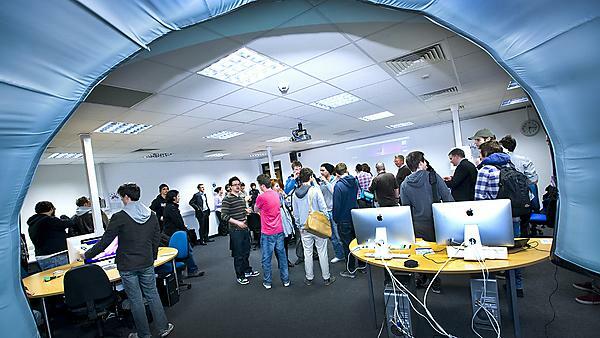 The lab is used by Digital Art and Technology students to develop their ideas around a networked culture where everyone and everything is connected. The Smarter Planet Lab is a test bed to explore how The Internet of Things is transforming our relationship with the world, building a more sustainable and stable planet. What do we mean by a Smarter Planet? IBM's concept of a Smarter Planet refers to the way that intelligence is being infused into the systems and processes that make the world work - into things no one would recognise as computers: cars, appliances, roadways, power grids, clothes, even natural systems such as agriculture and waterways. Trillions of digital devices, connected through the Internet, are producing a vast ocean of data. And all this information – from the flow of markets to the pulse of societies – can be turned into knowledge because we now have the computational power and advanced analytics to make sense of it. With this knowledge we can reduce costs, cut waste, and improve the efficiency, productivity and quality of everything from companies to cities. The technology to build a smarter planet is here, but often instigating the use of these systems into industries that have been around for decades, even hundreds of years, would be complex and involve huge political and economical decisions. It is clear that we need new skills and fields of expertise, new ways of working and thinking. A smarter planet will require a profound shift in management and governance toward far more collaborative approaches. Find out more about the Smarter Planet concept. The IBM Academic Initiative is a global programme that facilitates the collaboration between IBM and educators to teach students the information technology skills they need to be competitive and keep pace with changes in the workplace. It allows students open access to full versions of hundreds of IBM programmes and software, providing real world experience on industry-proven software. Find out more about the IBM Academic Initiative. In addition, IBM are offering work placements to Digital Art & Technology students and graduates and offer a prize for work created using their software at the Graduation Ceremony. This unique and valuable partnership is an example of the University's commitment to supporting new enterprise and dedication to giving students the best possible training to prepare them for the competitive life of the working world.